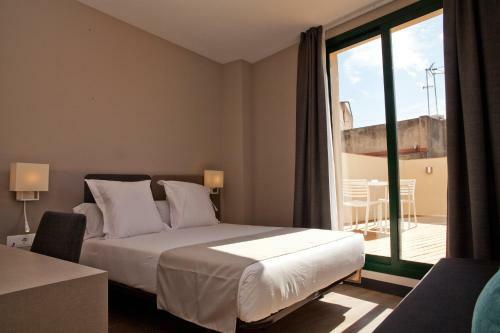 Set in Barcelona in the Catalonia Region, 200 metres from Plaza Reial, May Ramblas Hotel boasts a sun terrace and views of the city. Free WiFi is available throughout the property. Every room at this hotel is air conditioned and features a flat-screen TV with satellite channels. A terrace or balcony are featured in certain rooms. All rooms have a private bathroom with free toiletries and a hairdryer. There is a 24-hour front desk at the property. La Seu, Cathedral of Barcelona is 400 metres from May Ramblas Hotel, while Portal de l'Angel is 500 metres away. 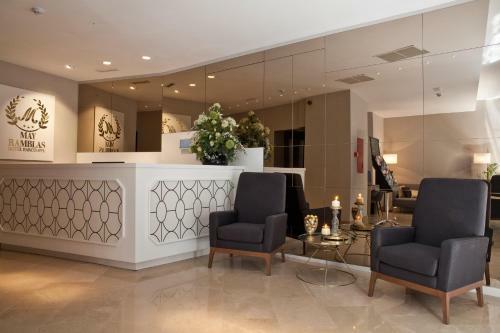 Barcelona El Prat Airport is 12 km from the property. 1. Nice central location for sightseeing, it is easy to walk to everything. 2. Nice bathroom. 3.Nice cleaning every day and smiling cleaning staff. 1. Bad location for a good sleep at night. Its right next to a Church, that rings the bells every morning and at nighttime you can hear all the drunk people on their way home. 2. Info and pictures about their rooms is not correct on their homepage on Booking.com. We booked a Superior room, but they only have two rooms like the ones on the pictures on their homepage and they are handicap rooms. All other rooms was not at all like the pictures, because there was small halls and many walls in the rooms, so the main space in the room around the bed was very tiny and not at all like the pictures on their homepage. The reception did not wanna do anything about it and claimed, the fake informations on Booking.com was not their mistake. We called Booking.com and they said, it was the hotel themselfes that put in the information, so the reception lied to us. Booking.com contacted the hotel and first after that, reception wanted to help us, but at that time we only had 1,5 day left out of our 4 days, so we didn't bother moving room. 3.Info and pictures about iron and iron board in the room is not correct on their homepage on Booking.com. They do not have iron and iron board in the room, they only have a few ones in the reception for loan to all guest at the hotel. Again the reception did not wanna do anything about it and claimed, the fake informations on Booking.com was not their mistake. We called Booking.com and they said, it was the hotel themselfes that put in the information, so the reception has lied to us. Booking.com contacted the hotel and first after that, they wanted to help us. We then got iron board in the room for the last 1,5 days. We had very bad and arrogant service in the reception from a small bald man, when we told about the fake informations and he did not wanna help us, but after booking.com contacted the hotel, he finally apologized and helped us. Excellent staff, especially Manel. He greeted us, gave us excellent directions and suggestions for activities. He was gracious, professional, and super helpful. Convenient location. Staffed 24/7. Comfortable and clean. Rooms are very small, for a 3-person family. A bit noisy, but that goes with being adjacent to La Ramblas. What was meant to be a 1 night stay ended up being a 2 night stay. 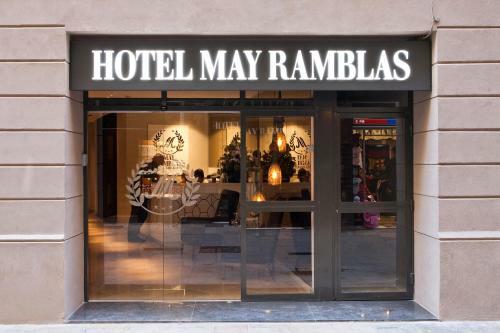 I fell in love with Barcelona and part of it has to do with May Ramblas Hotel, literally in the HEART of everything! 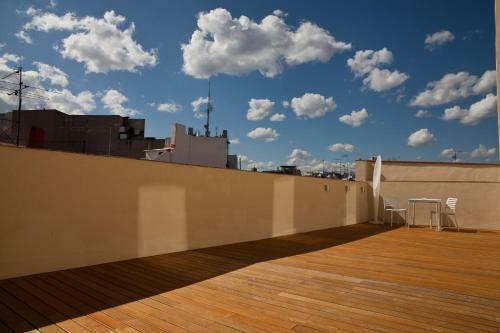 Located right in the middle of Las Ramblas, 10min walk to Gothic Quarter, 10min bus ride to Barceloneta Beach. 10min subway ride to La Sagrada Família. The staff was very pleasant. The lady that checked us in (I wish I remembered her name) was AMAZING! Very easy to communicate with. She took her time to explain and draw out all the major spots to hit on a local map she gave us. Rooms were very clean, the whole establishment smelled nice. I didn’t get to try their food but the hotel is close to many restaurants and shops, the hotel price was exceptional. I have nothing to complain about. 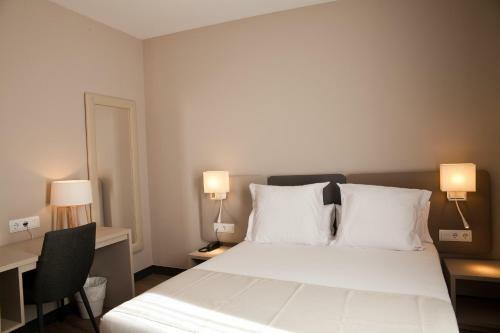 If you ever plan to visit Barcelona, you will not regret choosing May Ramblas Hotel. The location was great and the room was everything that we needed it to be. The staff at the reception were friendly. Fridge could’ve been colder. The room size was small (but this didn’t bother us so much). The pillows on the bed seem to be half sized - luckily we sleep well but this could be an issue for some guests. Didn’t look like the photo we saw because every other room seemed to be at least 50% bigger! Staff was very nice and so helpful. Area is centrally located. Rooms are clean with spacious bathrooms and comfortable beds. No blanket first night for 3rd couch bed. Great location just off La Rumblas meant you were close to the action but not to close to hear it. Staff were super friendly and helpful. Some of the bathroom fixtures needed maintenance. Good location and daytime desk staff was so helpful and polite. You can not sleep in the room. There is construction work in the hotel the sound of the drilling could be in your room it is that loud from 8am all through the day. There is a church outside that rings it's bell every hour (the bell goes to the time, i.e 9 rings for 9pm). We booked a highest cost room with a terrace, we even offered to move to a single room to be able to sleep. The towels had large holes in them. You need to request a kettle but they won't provide mugs. The shower pressure is awful. We considered flying home early. Staff , particularly Manuel, were very helpful. I couldn't open the windows for natural ventilation. hotel's policy to lock the windows.... because of this it was dust in the room. The gentleman who checked us in was very nice and informative.